In addition to excellent planning and the early provision of tools for monitoring and evaluation, Bremen (Germany) closely co-operated with local stakeholders and with peer cities and networks during the evaluation process of the Sustainable Urban Mobility Plan (SUMP) adopted in 2014. The city made efforts to learn lessons strengthen success stories and avoid failure for the next round of transport planning. Thanks to these efforts, Bremen was crowned as the winner the 2014 European SUMP Award. Due to its experience in traffic management - Bremen first implemented a traffic development plan in the mid-nineties - Bremen is nowadays one of the largest German cities with a balanced modal split. 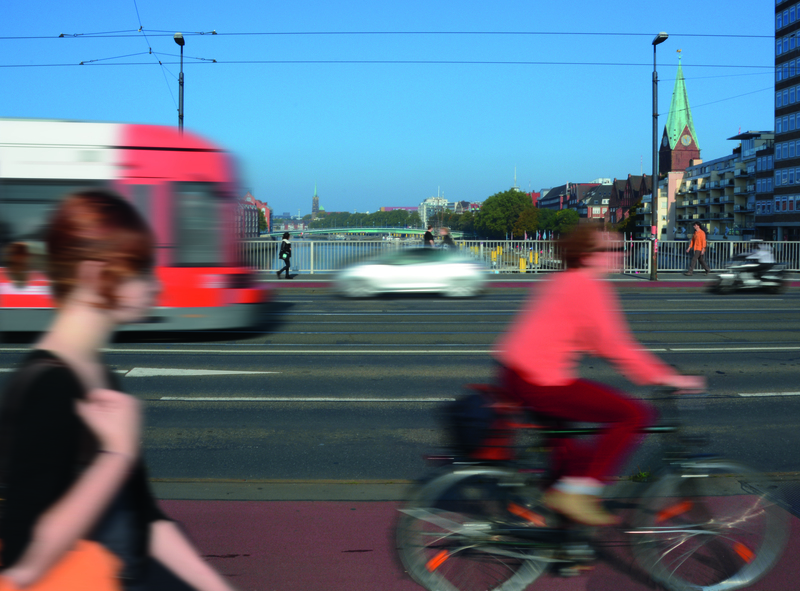 The Bremen SUMP (Verkehrsentwicklungsplan Bremen 2025), adopted in 2014, intends to actively promote ecomobility, improve the quality of life in the city by optimising the transport system and reducing the negative impacts of transport such as safety risks, pollution and noise. Among the objectives of the city, Bremen wants to achieve a 20 – 25 per cent increase in bicycle traffic and a 15 – 20 per cent increase in public transport by 2020. To achieve these objectives, the city of Bremen has adopted a plan which covers all modes of transport (including walking, cycling, public transport and cars), all traffic purposes (including travel to work or school, shopping, leisure, etc.) and both passenger and freight transport. The SWOT enables Bremen to carefully analyse the existing traffic infrastructure and mobility patterns. In Bremen, the SWOT analysis is based on a sound database and a wide public consultation via the internet. The expected performance of measures were assessed through the scenario analysis. Five scenarios were selected, each of them illustrating an ‘extreme choice’ scenario (e.g. massively promoted car traffic or intensely promoted ecomobility). The modelling of the scenarios allowed the city to compare the potential outcomes and costs of the measures. It clearly showed that the promotion of active mobility is the most efficient scenario. The city of Bremen conducted a cost-benefit assessment in collaboration with an external expert. Measures were individually assessed and classified according to their societal, environmental and spatial impacts. In a second step, measures were assessed with regards to potential external factors such as the technical feasibility or the political support. The city of Bremen performs monitoring activities on the implementation process too. The SUMP contains an evaluation strategy which sets the elaboration of an evaluation report per legislative period (every four years – first report in 2018). Co-operation is an important part of both the planning and implementation process. Bremen worked together with neighbouring municipalities and exchanged with Groningen (Netherlands) and Oldenburg (Germany) on traffic strategies at the transnational level. The entire SUMP process is monitored by an advisory board which is also in charge of the monitoring of the evaluation reports. The board is composed of members of the local parliament and external stakeholders (motorists’ and cyclists’ associations, chamber of commerce, environmental NGOs…). The evaluation processes have allowed Bremen to make highly informed decisions when implementing its SUMP. For instance, the scenario analysis which relies on a projected traffic model for the year 2025 was particularly useful to select the best locations for future rail stations. The modelling of the future behaviour of the population in terms of mobility allowed the municipality to select only the stations which will be used by a minimum number of passengers. The tool was especially useful as some stations performed unexpectedly well. Likewise, the consultation of stakeholders and citizens included in the cost-benefit analysis has been beneficial. By way of example, the scenario analysis suggested to build a new tram line through a park. This new line was expected to be very efficient however it created a high level of dissatisfaction among the population. As a result, the municipality did not implement the construction of the controversial tram line and selected another itinerary which meets both the public’s satisfaction and technical needs. The first evaluation activities conducted by Bremen allowed the city to identify both challenges for the future and ‘success stories’. On the one hand, major challenges identified are related to the use of the private car and the use of conventional fuels. They are also related to the technologies and the unpredicted impact they may have on urban mobility. On the other hand, Bremen considers that the strength of its SUMP process is the regular evaluation of the SUMP itself and of the different measures. A four-year evaluation cycle is considered most suitable by the municipality to collect relevant information before updating the measures. With regards to transferability and knowledge-sharing, the city of Bremen is keen to share its experience and the lessons learnt with different stakeholders. The municipality is in regular contact with different local action groups and often takes part in workshops and gives presentations, both at the national and European levels.